Paladin wrote: Thanks for your reply, you are right, I forgot about that. Guess I was dazzled by the numbers. I'll continue crafting and use TU4 Labrys meanwhile. Is it even possible to reach the 280 IAS breakpoint without KRA rw? I got Candlewake, which gives a decent screendmg-boost, but 280 ias is out of reach then. That weapon is not that bad. Yes, skills and/or proc is missing, but damage wise its a nice upgrade over T4. The clearspeed wont go up drastically, but you’ll notice the difference. I would bless with creepy for Str and Crushing blow, and MO with Deadly strike. In the meantime, you can look for a second sacred labrys and try go get an even better one with proc Or skills! For candlewake, it is one of the best armors. The SU labrys and gotterdammerung, both BIS weapons you should look for, both have IAS on the weapon itself, so there the cap of 280 is pretty easy. 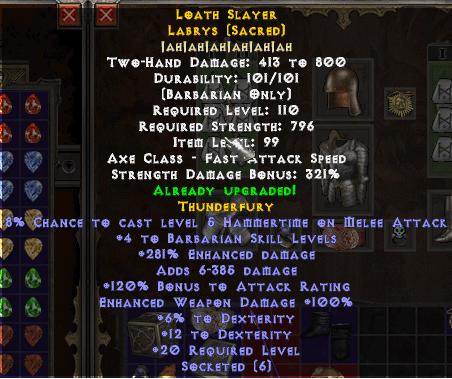 What i did with my crafted labrys was look at the IAS i had without runes in my armor. I filled up my slots with SHA runes to get the 280 cap, then 200 FHR (mostly with MO’s on armor) and of course max res ( didnt need runes for this, MO’s on rings + charms was enough), followed by LAH runes for +3% all stats. Don't underestimate raw damage of craft even if there is nothing else on it. Especially vs bosses, you should feel pretty significant upgrade, where crushing blow from TU doesn't work. Well, i did say that it should be used, before getting a better one. Hey, thank you for the guide. I followed it with some minor adjustments. I'm at level 124 now and have collected almost every 105-120 level charm. Just crafted a few days ago this weapon, do you think it is ok? I have 10k max damage (buffed). Any thoughts about what to add with MO's? Thans one of the best crafts ive seen so far. Nothing to add. Only thing is str > dex. But thats a very minor thing. GG my friend. I’d give you a cookie, but apparently i cant???? This craft gave me goosebumps. haemoneptra wrote: I’d give you a cookie, but apparently i cant???? schroedinger wrote: Hey, thank you for the guide. I followed it with some minor adjustments. I'm at level 124 now and have collected almost every 105-120 level charm. Just crafted a few days ago this weapon, do you think it is ok? I have 10k max damage (buffed). Any thoughts about what to add with MO's? What is everyone's favorite set up for this build for boss killing and just regular farming?